An absolutely stunning and amazing book. There were many overnight hours spent with a little light, awake and reading. Hustvedt demonstrates such thorough knowledge and ease about her topic that her academic precision never overpowers the compelling story of Charcot, Salpetriere and the “star” hysterics. Hustvedt uses three main women who were in the care of Dr. Charcot to illustrate numerous social conditions. Through their stories, we are able to understand the medical theories of the time, the societal obsession and repulsion with gruesome science, the possible (acceptable) roles for females, religious fervor, class discrimination, medical morality, artistic representation and the role of the supernatural. The idea of an insane asylum is always harrowing, particularly in the days before rational medication and sympathetic nursing. They are often the setting for horror and mystery movies and novel, for there is nothing my psychologically upsetting than to a) lose one’s mind or b) to not be believed to be sane. In Bedlam (1946, Val Lewton), a caring young woman (Anna Lee) unwittingly discovers the horrors within St. Mary Bethlehem Hospital and the distinctly serpentine creature that oversees it (Boris Karloff). Her determination to expose him lands her in Bedlam where she must struggle to maintain her own sanity among the truly disturbed. 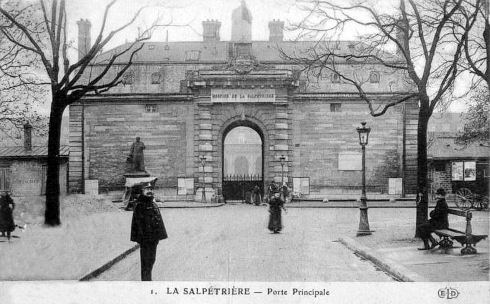 What is so illuminating in this book is how very unlike Bedlam that Hopital Salpetriere was. Charcot’s wards were not considered insane and therefore did not live in the asylum ward. They enjoyed a certain status among the doctors, staff and other patients and were subject to lengthy spells of normal behavior. Some even came and went from the hospital for months at a time to work and live in Paris. Ostracized from “normal” society, they enjoyed an unusual sense of luxury within the walls of the hospital. 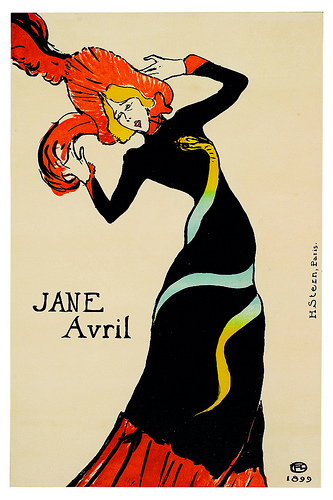 Jane Avril, a famous dancer at the Moulin Rouge, was an occasional patient of Charcot. But, in exchange for this relatively independent lifestyle, they were test subjects for Charcot’s research — something it seems they were all too willing to be. His subjects became something of celebrities. Charcot’s frequent lectures were open to the public as well as to other researchers and doctors. At any one of these spectacles, a visitor might witness hypnotism, suggestion, involuntary contractions, and other outbursts that only hysterics could produce. Many hysterics also suffered from anesthesia in a certain hemisphere of the body. Like a Coney Island freak show, doctors would poke large needles completely through the arm of a patient who had no feeling to prove the biological symptoms of hysteria. Asti Hustvedt divides her treatise into short chapters, more like sections, that deal with a particular topic. It makes a seemingly spindly subject very accessible and organized. Medical terminology is used, but always explained. French phrases are sometimes thrown in, but they too are elaborated upon if they are not entirely obvious. Though much was questioned about Charcot and his muses’ veracity, Hustvedt primarily focuses on what we do know. She draws from dozens of sources such as doctor’s reports, newspapers, medical files, municipal records, interviews and fascinating photographs (an art form in its infancy) and sketches. While probably not for the very faint of heart, the book is not gruesome or gory. There are descriptions of medical procedures and the case histories of the patients tends to be somewhat upsetting (no wonder then that they became hysterics). Though it is not able to medically define hysteria for a modern system, it poses viable and probable causes for its influence during the time — and what it has become today. It is rather incredible to gauge just how far we have come, and yet how very little we still understand. Many thanks to the lovely folks at W.W. Norton for the review copy. Read an interview and an excerpt on NPR.org.